Listen now to our recent interviews with industry leading finance, procurement and operations leaders. In this episode, Chris Cody, CEO of Highly Functioning and former cannabis dispensary owner shares his insights on how to manage cash flow and the mistakes cannabis small businesses make when it comes to operations. In this episode, Andrew Hunzicker, the founder of DOPE CFO shares his insights on best accounting practices for cannabis businesses under strict compliance laws, and how to win in a growing industry. In this episode, Jon Brodsky, the Country Manager at Finder.com shares his insights on understanding the why behind company spending, how to manage multi-locational teams, and how to align your culture with company spend processes. In this episode, Brittany Nasso, the Controller at Voices.com shares how to drive change and efficient processes that are positive on the bottom line, and also how she made the switch from big four firms to leading finance teams in fast-growing companies. Tania Seary is the president and founder of Procurious.com, the worldâ€™s first online community dedicated to procurement and supply chain professionals, which now has 60,000+ followers and members in 140 countries. In this episode, Tania shares how to create a fulfilling career in procurement, embracing diversity, and what the next generation of procurement professionals need to know. Lilia Stoyanov is the CEO of Transformify.com, a recruitment platform. Prior to founding Transformify, Lilia led a team at Coca Cola, where she implemented digital transformation processes in P2P. In this episode, Lilia shares mistakes companies face when it comes to tracking company spending in the procure-to-pay cycle, and how to evaluate the best P2P Solution. Kate Motonaga is the COO/CFO of the Museum of Contemporary Art in L.A. Prior to joining MoCA, Kate led finance teams in billion dollar companies in steel, mining, and CPG. In this episode, Kate shares the secrets within the world of world-class museums, such as the hidden costs behind Jack Pollock paintings, and being a female CFO in a male-dominated function. Paul Riegel, CPA, CGA is the Regional Director at the CFO Centre, a firm that provides the skills and experience of large company CFOs to small & medium sized enterprises on a part-time basis. In this episode, Paul shares the red flags to look for when it comes to poor spend management, and the tech stack recommended for CFOs to cultivate a healthy Spend Culture. Steve currently serves as the CFO and Assistant Dean at UCLA School of Law where he has worked for the past 21 years. Steve oversees the $90 million budget and 200+ staff at UCLA Law. Learn about how Steve started out as an assistant accountant, the secret tools to level-up your game as a finance leader, and what it takes to be the CFO of a world-renowned law school. Hans is the Head of Digital Procurement at IBM, and has over 25 years of professional experience working within and with Fortune 150 or start-up companies. Opinionated, passionate and experienced, learn what Hans thinks of the future of procurement and why automation is a tool, not a goal. Rob Dibacco is the COO/CFO of The Arizona Charter School Association. Learn how Rob manages the financial operations of a non-profit organization, how to implement a purchasing process for educational institutions, and how to scale spend management sustainably. In the seventies and eighties, GE was the training grounds for overachievers who would go on to head other companies and challenge the status quo. One of these leaders is Michael Dinkins, who also happens to be one of the most visible faces in the community of Corporate Finance. Peter Gebert is an unusual Finance leader. Right from his beginnings as an accountant working at mining sites in the Arctic Circle, to his astonishing successes leading finance for billion-dollar tech and biotech companies in the Valley, Peter has shown contempt for workplace silos. Learn how Peter works side-by-side with every department in the company to steer companies into new and path-breaking directions. Lindsey Head is the CFO of J Public Relations - and she has figured out her way to financially manage an efficient and lean PR agency. Rather than asserting controls or pushing a budget onto the operations itself, Lindsey truly believes that giving her employees the power to make decisions from the bottom up is the culture she wants to promote as a CFO - a proactive spend culture. 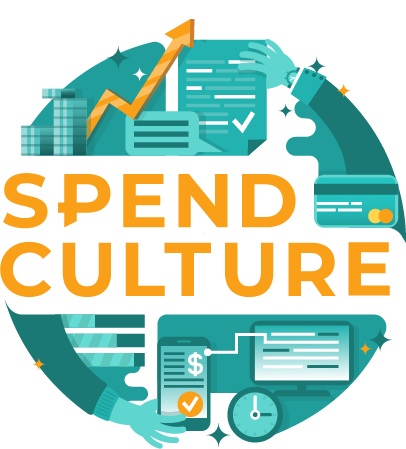 Discover how Spend Culture affects your organization. Is your company spending unrestricted, democratic, administrative, or agile?